These motorcycles equipped with combined-brake systems have a proportioning control valve (PCV) that mechanically proportions brake force when the rear brake is applied. A seal in some PCV's is improperly shaped, and brake fluid leakage may occur. If the motorcycle continues to be used after a leak occurs, the rear brake would eventually become inoperative. A loss of rear brake force could increase the risk of a crash. Dealers will inspect the rear brake for leakage. If leakage is confirmed, the dealer will replace the PCV. The recall is expected to begin on February 3, 2005. The Office of Defects Investigation, which is a branch of the NHTSA, has not yet added this recall into its online database as of this writing. On Apr. 20, 2005, I was driving at highway speed and in traffic when I was sprayed in the face and all over my clothing with brake fluid. I lost at least 50% braking immediately. I became frightened for my safety and exited my lane and then the elevated highway. I used down shifting and light touches to the front brake only to stop. I pulled over to the nearest driveway and got off to inspect my bike. My front tire, left brake caliper, the front fairing and windshield, and, of course, I were all dripping with brake fluid. It is as if the entire braking system had opened up and poured out its fluid within seconds. To make matters worse one dealer and then Honda's Customer Dis-Service line told me to bring it in and they will inspect it (when they get to it). I talked with several people at American Honda and no one was willing to help with this serious bike failure. The manufacturer's story was I should take an undrivable, gravely disabled motorcycle to a dealer for inspection. Three days later I found out about this recall of the brake pcv. I urge all of you to take your bikes in immediately. Failures from this valve can be very dangerous and Honda is beyond nonchalant and careless about it. I am grateful to G.N. Gonzales Honda of Baton Rouge and Mr. George Gonzales who sent a truck to me some 90 miles away and trailered my bike to his dealership. I have lost all confidence in Honda to care about this failure. We must as bikers get out the word on this recall before someone gets hurt. Lawyers begin your suits. 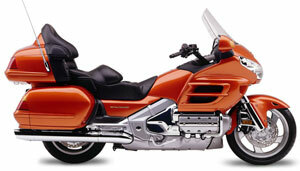 We are having trouble with brakes on a 2002 Honda Goldwing that was converted into a trike by Motortrike. Twice we have lost our brakes going down steep grades, (Monarch Pass) and a 16% grade into the Black Canyon of the Gunnison. It is my understanding that the bike came out with disc brakes and they were converted to drum brakes when the bike was converted. We have had the whole brake system checks and nothing seems to be wrong with the real brakes that is noticable. Is anyone else having this problem? We thought about converting the braking system to disc brakes but were told that probably would not solve our problem. We cannot find out what the problem is, therefore cannot solve it.